AMBOASARY, Madagascar, Aug 4 2016 (IPS) - Mirantsoa Faniry Rakotomalala is different from most farmers in the Greater South of Madagascar, who are devastated after losing an estimated 80 percent of their crops during the recent May/June harvesting season to the ongoing drought here, said to be the most severe in 35 years. She lives in Tsarampioke village in Berenty, Amboasary district in the Anosy region, which is one of the three most affected regions, the other two being Androy and Atsimo Andrefana. FAO estimates that a quarter of the population - five million people - live in high risk disaster areas exposed to natural hazards and shocks such as droughts, floods and locust invasion. “Most farms are dry, but ours has remained green and alive because we dug boreholes which are providing us with water to irrigate,” she told IPS. 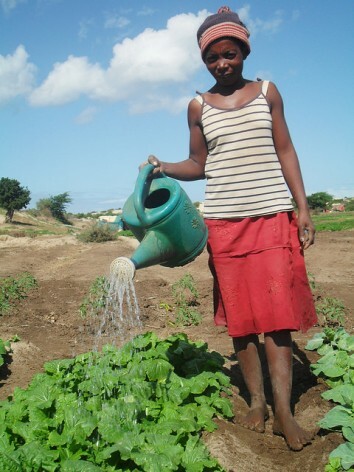 Timely interventions have changed her story from that of despair to expectation as she continues harvesting a variety of crops that she is currently growing at her father’s farms. Some of her sweet potatoes are already on the market. Rakotomalala was approached by the U.N. Food and Agriculture Organisation (FAO) as one of the most vulnerable people in highly affected districts in the South where at least 80 percent of the villagers are farmers. They were then taken through training and encouraged to diversify their crops since most farmers here tend to favour maize. “We are 16 in my group, all of us relatives because we all jointly own the land. It is a big land, more than two acres,” she told IPS. Although their form of irrigation is not sophisticated and involves drip irrigation using containers that hold five to 10 liters of water, it works – and her carrots, onions and cornflowers are flourishing. “We were focusing on the challenges that have made it difficult for the farmers to withstand the ongoing drought and through simple but effective strategies, the farmers will have enough to eat and sell,” says Patrice Talla, the FAO representative for the four Indian Ocean Islands: Madagascar, Comoros, Seychelles and Mauritius. FAO estimates that a quarter of the population – five million people – live in high-risk disaster areas exposed to natural hazards and shocks such as droughts, floods and locust invasion. As an agronomist, Lee studies the numerous ways plants can be cultivated, genetically altered, and utilized even in the face of drastic and devastating weather patterns. Talla explains that the end goal is for farmers to embrace climate-smart agriculture by diversifying their crops, planting more drought-resistant crops, including cassava and sweet potatoes, and looking for alternative livelihoods such as fishing. “Madagascar is an island but Malagasy people do not have a fish-eating culture. We are working with other humanitarian agencies who are training villagers on fishing methods as well as supplying them with fishing equipment,” Talla told IPS. “Madagascar is facing great calamity and in order to boost the agricultural sector, farming must be approached as a broader development agenda,” he added. He said that the national budgetary allocation – which is less than five percent, way below the recommended 15 percent – needs to be reviewed. The South of Madagascar isalso characterized by poor infrastructure and market accessibility remains a problem. Though FAO is currently working with farmers to form cooperatives and there are pockets of them in various districts in the South including Rakotomalala and her relatives, he says that distance remains an issue. “You would have to cover so many kilometers before you can encounter a village. Most of the population is scattered across the vast lands and when you find a group, it is often relatives,” he says. Lee noted that farmers across Africa have grown through cooperatives and this is an issue that needs to be embraced by Malagasy farmers. Talla says that some strides are being made in the right direction since FAO is working with the government to draft the County Programming Framework which is a five-year programme from 2014 to 2019. The framework focuses on three components, which are to intensify, diversify and to make the agricultural sector more resilient. “Only 10 percent of the agricultural potential in the South is being exploited so the target is to diversify by bringing in more crops because most people in the North eat rice and those in the South eat maize,” Talla explained. The framework will also push for good governance of natural resources through practical laws and policies since most of the existing ones have been overtaken by events. Talla says that the third and overriding component is resilience, which focuses on building the capacity of communities – not just to climate change but other natural hazards such as the cyclone season common in the South. “FAO is currently working with the government in formulating a resilience strategy but we are also reaching out to other stakeholders,” he says. Since irrigation-fed agriculture is almost non-existent and maize requires a lot of water to grow, various stakeholders continue to call for the building of wells to meet the water deficit, although others have dismissed the exercise as expensive and unfeasible. “We require 25,000 dollars to build one well and chances of finding water are often 50 percent because one in every two wells are not useful,” says Lee.